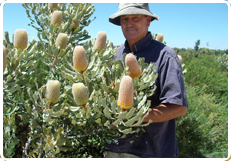 Founded in 1978 by Clive and Maureen Tonkin Westways originally supplied dried, bleached and coloured wildflowers to Wholesale Exporters in W.A. After experimentation with various preserving methods Clive has perfected a unique preservative which leaves the flowers supple with some of the original perfume. These flowers are able to be used with fresh garden flowers and placed in water or with dried flowers and will last up to two years some times longer. Most of these flowers are picked on Westways treated, sleeved, boxed and sent overseas mainly to Japan. This process enables flowers picked in the different seasons when they are blooming to be available for purchase all through the year. 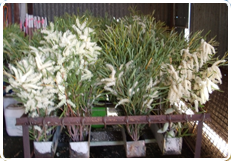 Feel free to visit the working shed where some variety of flower or foliage is usually being preserved.